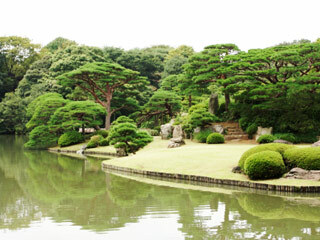 Rikugien Garden (六義園) is Japanese style garden in Tokyo and one of the special place of scenery. Rikugien was established in 1702 by feudal lord Yoshiyasu Yanagisawa who was well-know for his literary accomplishments. The name RIkugien was taken from the six principles of composing Japanese waka poetry which were derived from an ancient Chinese book "Mao-Chin." It is typical "Kai-yu(Go-round)" style garden with, 88 spots of literary significance arranged along a path surrounding a pond with an islet. Rikugien is also famous for Azalea flowers and Shidare-Sakura. Fee: 300 yen for adults, 150 for seniors, fee for kids. Rikugien has the greatest Shidare-Sakura in Tokyo. In the end of March, it will be lightened up and you can enjoy beautiful night Sakura. This is the best Sakura scene you can have in Tokyo. Another beautiful feature is Azalea flowers. In April, the color of gardens will be change to nice pink. The middle island is represent the relationship between man and woman. The rocks create the images of man and woman. There are tea houses where you can have great tea and sweets with nice scenery of pond. Also there are couple of resting house. One is located right next to the waterfall where you can have cool and quiet moment with the flow of water. Another one is located in the Azalea hills. There is small hill where you can observe entire pond. It is called Fujishiro pass. It has about 35m high.